Authentic Performance Activities facilitate a student's understanding of a lesson's usefulness in real life. They are also an Understanding by Design (UbD) assessment tool. Focus questions act as pre- and post-assessment indicators of the activity's effectiveness. 1. Why do we sometimes study things in nature when inventing things to solve problems for humans like snowshoes and camouflage? 2. Can you think of any other helpful inventions that may have mimicked natural structures? 3. 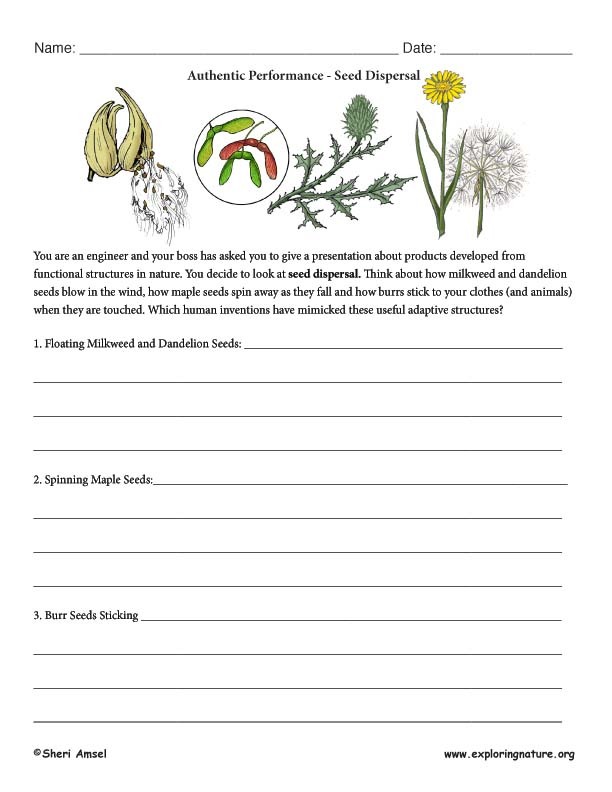 What inventions may have come from studying seed dispersal? You are an engineer and your boss has asked you to give a presentation about products developed from functional structures in nature. You decide to look at seed dispersal. Think about how milkweed and dandelion seeds blow in the wind, how maple seeds spin away as they fall and how burrs stick to your clothes (and animals) when they are touched. Which human inventions have mimicked these useful adaptive structures?